This year I have started to enter competitions again and have done ok, with 36 images over all competitions reaching the final stage. My style of imagery is not really suited to competitions these days as they are a little "commercial" but I still love to enter and get a buzz if I am lucky enough to get picked. Recently I made a BLOG here about my iceberg that won the Polar Passions Category in Nature's best, and I was very proud of that as anything that raises awareness of the Arctic is a positive step. I have also received two Highly Commended awards in competitions this year and thought you might be interested in the backstory and some tech info too so here goes! 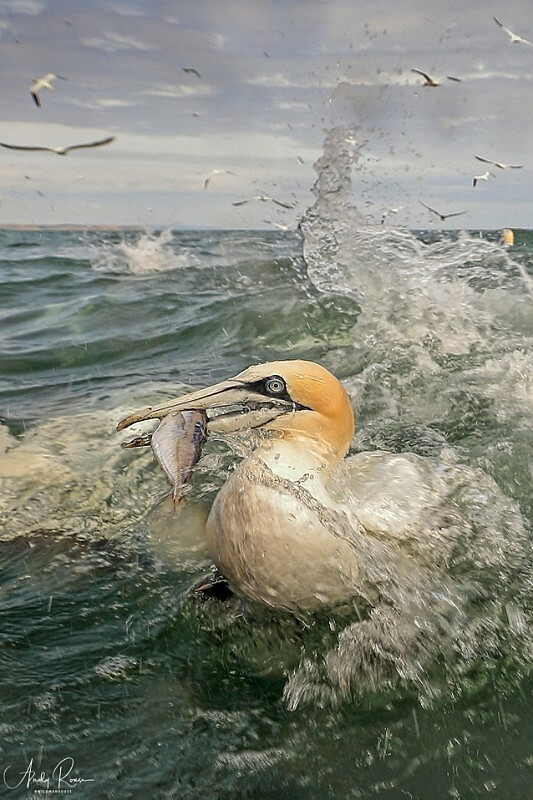 The above Gannet was taken on one of my all day Gannet Diving workshops this summer. When I set out to take this shot I really wanted to do something different from the norm. There are so many beautiful Gannet shots taken each year that it's tough to stand out as they are such beautiful birds. But being different has always been my trademark so as the Gannets were plunging in the sea all around us I sat back, watched and tried to work out a different approach. I quickly realised that I had to get down at the Gannet's eve level, so that I could include the sea, the horizon and other Gannets behind. The only way to do this was to have Suzie hang onto my legs whilst I literally hung down the side of the boat head first facing the water. My clients found it hilarious but it worked and I got much lower to the Gannets. Of course I wasn't quite low enough so had to hold the camera down and use the LCD screen to judge where the Gannet was. I set a decent shutter speed of 1/500th second to freeze any water, and was careful to lift the 1DX2 above the water when it threatened to engulf it! The result was this cool image and I hope that you see that being different and thinking outside the box can get some compelling images. Also having a very willing and capable girlfriend helps too!! As well as winning the Polar category I managed to get a HC in the Africa one that I've previously won before. It's a shot of Cheetah Malaika with a young cub that everyone seems to like and that is the important thing. As a photographer watching the interaction between a mother and her young is always an incredible treasure chest of images, you just gotta remember to really increase that shutter speed to avoid a lot of unwanted blur as the action can be very fast and very random. For this image I used ISO 800 for 1/640th second and that is good enough for most action, apart from when the little terrors are tearing round creating havoc! Always try to pick one cub and focus on it, and when the mother is involved keep your eyes out for any expressions on the cub's face as they tend to show their affection at this time. Some people might call this chocolate box. I hate this expression. As a photographer you are free to take any kind of image you like without being pigeonholed. 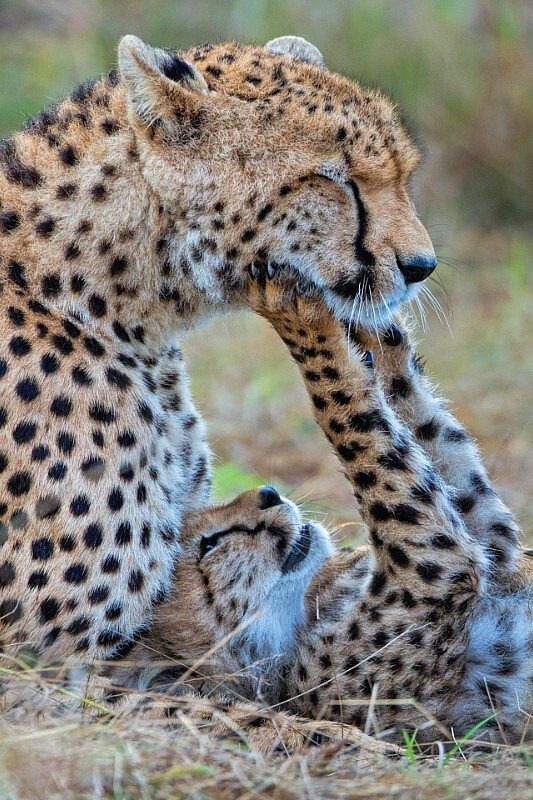 Any image of a Cheetah too that makes people smile and love Cheetahs helps their conservation, and they need all the help that they can get. Personally I cannot photograph enough Cheetahs and those of you coming along to my talk on Friday will be treated to a lovely collection of them in the second half. Right time to go now, yes I know you want the EOSR Blogs, they are coming trust me I am just very very busy right now. But they are worth waiting for!